Purpose: Use this document as a reference for viewing plan attributes in ctcLink. Depending on which plan type you choose there is a different set of options within the plan. 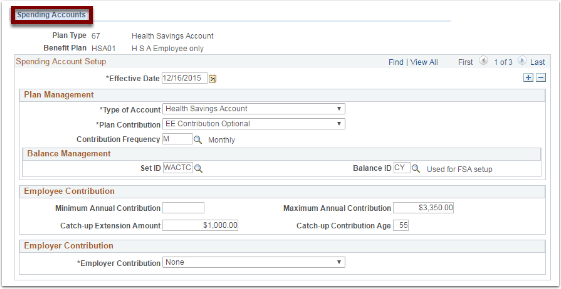 No Benefits Administrator should go into the Set Up HCM menu to perform configuration changes, so this QRG is provided for informational purposes only and not as a functional guide. As Pay1 is the system of record for: Health, Tabacco Surcharge (Simple Benefits), and Life (until 1/1/17 at which time it becomes a payroll deduction for MetLife), none of these Plan Tables contain much configuration. PeopleSoft is the system of record for: Savings, Spending (H S A, D C A, F S A), Retirement, and Disability benefits and as such more configuration exists for these Plans. The table for Spending is called “FSA Benefits Table” and the configuration for FSA, Dependent Care Assistance, and H S A, are all unique to those programs. The H S A example is provided below. 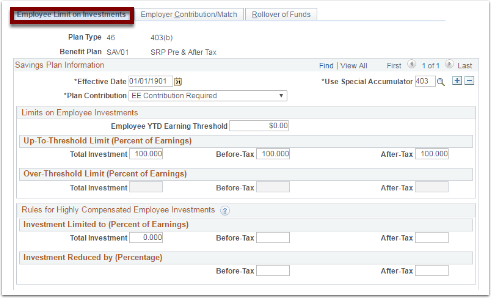 Retirement Plans all have an employer match hard coded in except for the XXX_W values as they are there as a placeholder until the employee has decided on a plan. They only use special accumulators: RT1 (PERS 1), TIA (all TIAA-CREF plans), or RT2 (every other plan/DRS).